In today’s fiercely competitive market for mid-size sedans, shoppers are just as likely to consider the Hyundai Sonata and Kia Optima as longer-established nameplates like Accord, Camry, or Malibu. That’s no surprise; these two models both earned their place in the top tier fair and square, with spacious, game-changing designs that performed well, earned great fuel efficiency, and offered very impressive feature sets and value for the money. But which one should you choose, the Optima or the Sonata? The Hyundai Sonata and Kia Optima are rivals in the marketplace, but they were conceived on the same platform, and they share powertrains, materials, and many other underpinnings. It's easy to shorthand it and say, they're the same car, but that's hardly the case when it comes to styling and trim choices, where each has its distinct identity and appeal. Both the Sonata and Optima have been redesigned since the 2015 model year. That's when the Sonata got a more even-tempered look to replace its formerly flamboyant shape. 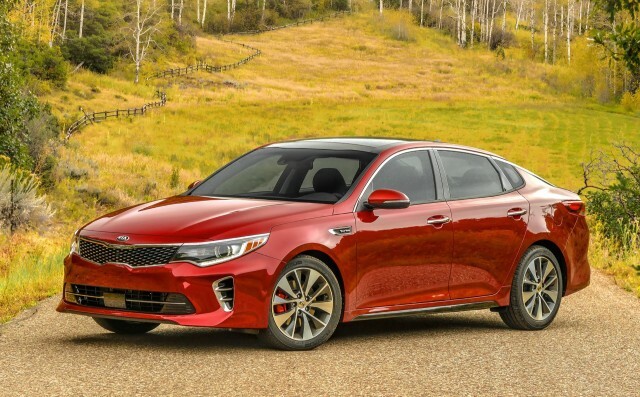 Meanwhile the Optima was revamped for 2016, keeping close to the form of the outgoing model, with some fine-tuning and finesse applied. Inside, the Optima inherits some Euro-influenced, upright-and-trapezoidal touches, as does the Sonata. Both models have become better detailed, with the corners pushed outward and more of a sense of front-seat spaciousness. Both models are powered by a 185-horsepower, 2.4-liter direct-injected 4-cylinder engine at the base level, or a 245-hp, 2.0-liter turbocharged inline-4 that’s the step up in performance. In both cases, there’s no longer a manual gearbox on offer, but the 6-speed automatic transmission shifts smoothly and more promptly than before. Between these two models, those with the base engine are plenty perky for most tastes, although the engine will be winding up in its rev range during long grades or in moderate acceleration with a full load. 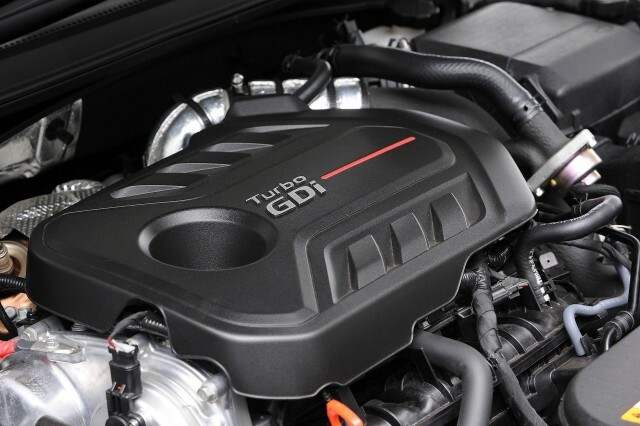 The 2.0T models have a different character entirely; they make a lot of torque at relatively low rpm, and their quiet, smooth drivability makes them closely resemble the characteristics of V-6 rivals. Where it starts to become a little more distinct between these two models is how the mid-range powertrain's presented. Both of them offer an available 177-hp, 1.6-liter turbocharged inline-4 and 7-speed dual-clutch automatic transmission. In the Sonata, it’s in the Sonata Eco, while in the Optima it’s a mid-range powertrain option, pitched as a step up in both fuel economy and performance. In the Sonata the combination feels tuned to be more conservative and efficiency-minded, but that seems to better suit this powertrain as it is. In most other aspects of the driving experience, these two models are closely aligned. We do think Kia maintains a slight edge in steering and handling, and this time, not at the expense of road noise. 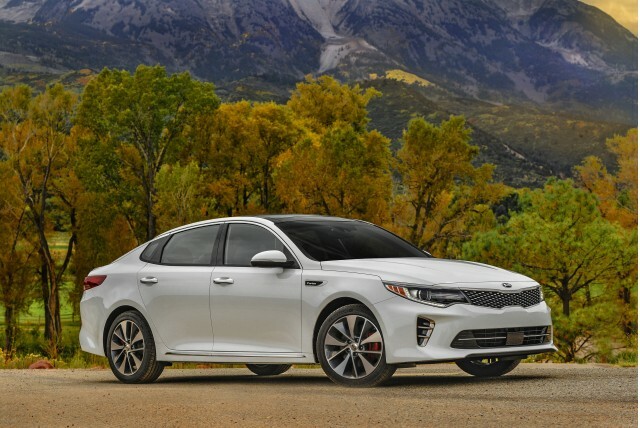 The Optima lineup as a whole is more compliant now, but we think that the SX 2.0T model has one of the best ride-versus-handling balances in its class. Although these models have somewhat different seating configurations, door cutlines, and such, their interior appointments are also quite similar. Front-seat comfort has improved, and they both now include height-adjustable front passenger seats. Back seats are among the most spacious in their class, by the numbers, although we continue to see these models to be a little tighter in back for taller occupants than the Honda Accord and VW Passat. Trunk space is about the same, and both of these models include split-folding rear seatbacks. The body structure for these models is essentially all-new, and crash-test ratings have been impressive. Both models offer forward-collision warnings and autonomous emergency braking. 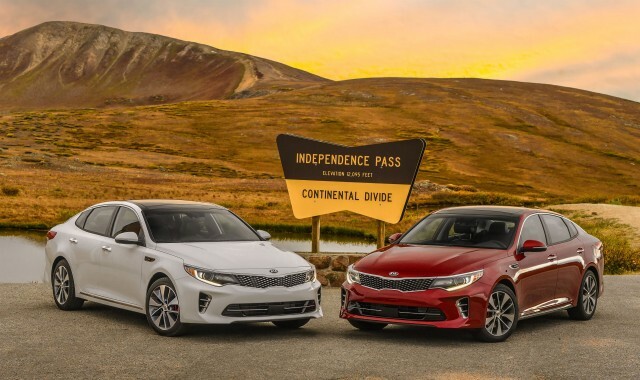 The Optima pulls ahead slightly in features and value. The Sonata is offered in SE, Eco, Sport, and Limited models, while the Optima lineup includes LX, EX, and SX models. 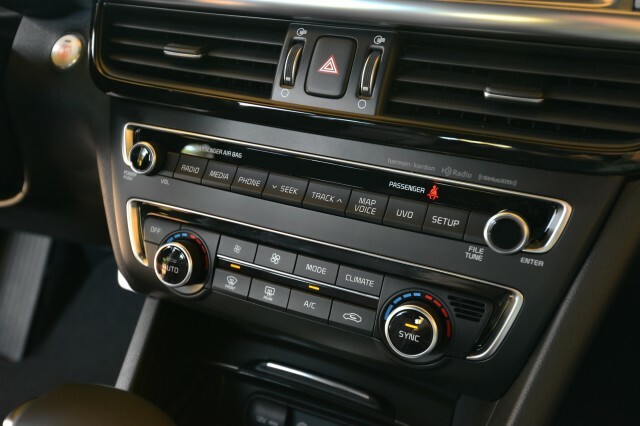 In the Optima, you can opt for rear parking sensors, blind-spot detection, and rear cross-traffic alert systems even at the LX and EX level, while even at the EX level you can upgrade to ventilated front seats and heated outboard rear seats—features that aren’t even offered in the top-of-the-line versions of some rivals. 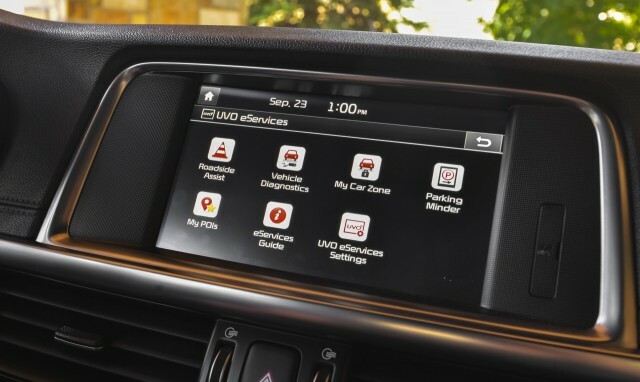 Both of these models now offer both Android Auto and Apple CarPlay, which allow users to connect their smartphones and access apps and other functions through the vehicle interface. We tend to appreciate Kia’s infotainment system just a bit more as it manages to pack in nearly as many features—as well as some additional items like geo-fencing, curfew alerts, and such—without the need for a subscription-based telematics services. .
For now, we’d put the Kia Optima just slightly ahead of the Hyundai Sonata—because we like its steering and suspension tuning slightly better and because its feature set seems to offer just a little bit more for the money, especially near the affordable end of the lineup. Both of these models are better than their game-changing predecessors in nearly every way. Even though they’re a little less distinct this time around, they’re smarter picks than ever before. The 2017 Hyundai Sonata is a strong family-sedan value, with inconspicuous looks hiding top-notch safety and fuel economy. The formal, attractive shape of today's Sonata is a 180-degree flip from its recent past. The Sonata does best in delivering a quiet, isolated ride; in turbocharged trim, it's still not really a sport sedan at heart. 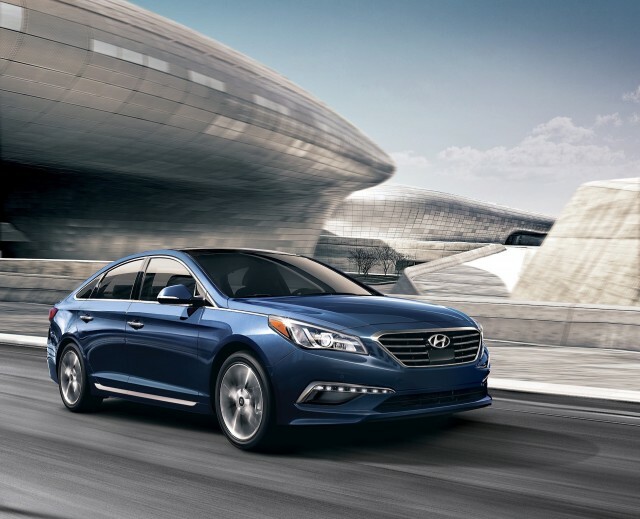 A spacious mid-size sedan, the Hyundai Sonata has comfortable front seats and lots of storage space. The Sonata is one of the safest family sedans on the road. Hyundai fits lots of features to the Sonata, everything from CarPlay and Android Auto to a hands-free trunk. The Sonata's gas mileage compares well with other excellent family sedans. We have sent your request for price quotes on the 2017 Hyundai Sonata and 2017 Kia Optima to the dealers you requested. They should be in touch shortly. Your request for a fast, free price quote on a 2017 Hyundai Sonata and 2017 Kia Optima is in process. The CarsDirect Dealer(s) listed below will contact you shortly to discuss your request and to provide a quote.